The Museum of Family History is a multimedia, interactive website. The Museum's Family History Theatre is designed to familiarize the visitor with some its audiovisual content through a myriad of both sound and video clips. You may also wish to take a virtual tour of the various audio or video aspects of the Museum by using the links in the column on the far right. Look to the not-t00-distant future for the Museum's Audio and Video Tours. 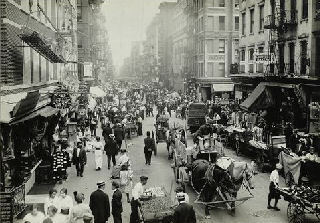 Lower East Side photo above courtesy of the New York Public Library Digital Gallery.